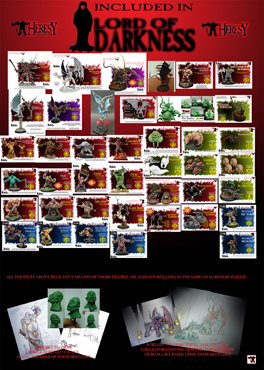 Conditions of Use : Heresy Miniatures Ltd , - Pledge Manager Store - Pledges shipping as and when figures are ready! Heresy shall deliver the goods ordered to the delivery address which you supply. All delivery times quoted on the Heresy site are estimates only based on availability, normal processing and delivery time. 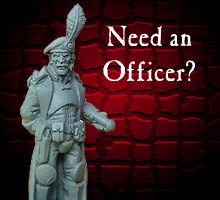 Heresy may deliver items in an order separately but shall charge you for postage and packing on the first delivery only. Title to the goods will pass to you on payment in full. Risk will pass to you on delivery. You must allow 28 days for your order to arrive as we cannot control the delivery of a parcel once it is in the postal system. E.G. Sometimes a parcel that should have taken 3 or 4 working days to arrive in Europe takes a couple of weeks. Please inform Heresy of non-delivery initially, after 2 weeks. If for any reason you are unhappy with any or all of the goods received, you can return any of them to Heresy for an exchange or refund, providing each is returned to Heresy within 30 days from the date of order or 7 working days from the day after you receive the goods (whichever is longer). You shall be responsible for the cost of returning goods for refund or exchange, except in cases of faulty, damaged or wrongly supplied goods. Heresy recommends that you use registered post or recorded delivery when returning goods. Heresy shall use reasonable efforts to replace damaged or defective goods but if replacement is not possible, or if an order is cancelled for any other reason under these Terms, Heresy's only obligation is to refund the full amount paid by you. This does not affect your statutory rights.